1) Change the name of modules and libraries to dwt to distinguish from Eclipse/SWT. 2) DWT API use char instead of String now. This helps DWT to interact with other D project smoothly since many other D projects using char as String. 3) Win32 struct and API prototype rewritten. All declarations are consistent with MSDN as well as std.c.windows.windows. Actually, std.c.windows.windows is imported and by a simple alias way, we can keep up with the update of Phobos easy. This change will give Windows developers a more native and intuitionistic feeling compares to Java/SWT. a. Phobos aliased LPTSTR to char* which is different from MSDN which is a (MBCS/UNICODE) version depended define. b. Phobos aliased WNDCLASS to WNDCLASSA is different from MSDN which is version depended define. Discard SWT's mechanism such as Callback and VtblCall. Part of DFC's COM library header file imported and implemented OLE_COM in D way. Web browser, Excel Viewer and PDF viewer examples are given though with bugs and feature missing, since the COM application is not easy to debug. 5) zwang's contribution to DWT is added: "sort indicator in the TableColumn widget". 6) DWT Extra Library established. dwtextra library will include some useful stuff which is not included in Eclipse/SWT official package. 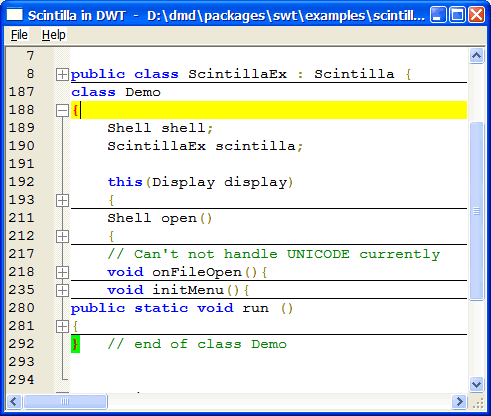 Currently I ported Scintilla (http://www.scintilla.org/) to DWT as the first component. Directory is \dwt\extra. When use extra lib, "import dwt.extra.all", and link to dwtextra.lib. volunteers are welcome to write customized component for DWT. See "Creating Your Own Widgets using SWT"
Very nice work Shawn. DWT imho is the best d gui toolkit for win32 atm. Keep up the good job!